Two Princeville events will be taking place at the Princeville Community Center later this month. The first features local, north shore artists who will be exhibiting their recent creations. It is a three day event starting with an opening gala night with pupus (appetizers) on Friday, October 26th from 4:00 to 7:00 PM. The show continues on Saturday, October 27th from 1:00 to 4:00 PM and on Sunday, October 28th from 1:00 to 4:00 PM. There are so many talented artists who live on the north shore of Kauai. Make sure you stop by to be inspired by their work. The Princeville Community Center is located at 4334 Emmalani Drive (across from the library and next to the playground). A second Princeville event will be held on Saturday, October 19th (weather permitting). 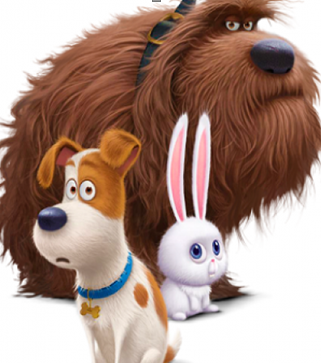 A giant screening of the movie, “The Secret Life of Pets” will be shown in Prince Albert Park (in front of the playground). Bring a picnic basket full of goodies and some chairs for a fun evening with the locals. The movie begins at dusk. These two Princeville events are sponsored by the Princeville Hanalei Fine Arts Committee and the Princeville Hanalei Events Committee. For more of my blogs go to the right-hand side of this page. Mahalo! Why not shed all the anxiousness about Hurricane Lane and walk/run in the Ohana Fit Fest coming up soon! Yes, residents of Kauai are more than grateful that we escaped the blow that was heading our way last weekend. We are experiencing some heavy rains again, but by October 6th this weather system will be past us and residents and guests to the island will be sharing the Wai Koa Loop as they walk or run through the obstacle course for a good cause. Organized by the Kauai North Shore Community Foundation and presented by Wilcox Health, the Ohana Fit Fest will be held on Saturday, October 6th. Run the 5K or the 10K, or walk the 5K. Obstacles along the way will excite you. You will climb and crawl, testing your coordination and balance. Sunny or rainy (fun in the mud), the race is a go on the Wai Koa Loop trail. For the 5K and 10K Run, medals go to 1st, 2nd and 3rd place finishers in each age division by gender. Challenge yourself and/or just enjoy the experience. Proceeds of the 2018 Ohana Fit Fest will fund the Fit Fund; priority will be given to organizations affected by the April 2018 Kauai flood. Not going to be on Kauai for this event? You may walk or run the Wai Koa Loop trail, minus the obstacles, any day of the year.